Three quarters of the earth’s surface is covered in water. Most of this water is in the oceans, some of it is in ice glaciers and at the poles. The rest is in rivers and lakes or trapped underground. Water is different from all other substances on earth, because it is found in its natural state in three different forms: liquid (water), solid (ice and snow) and gas (water vapour and steam). The way that water travels from the earth’s surface to the sky and then back to the earth’s surface is called the water cycle. 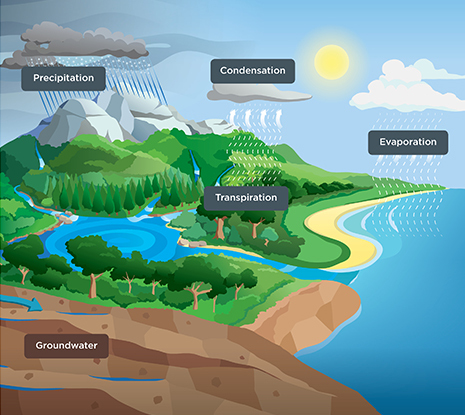 The water cycle has no start or end, but is always moving water around the earth. The sun is what keeps the water cycle going round and around. The sun’s heat warms water in oceans, rivers, lakes and even from ground surfaces. Some of this water then turns into a gas, or water vapour and rises into the air to form clouds, which are made from millions and millions of water droplets. This process is called evaporation. Plants drink water up through their roots and release water vapour through their leaves. This process is called transpiration and this water vapour also travels up to the clouds. When the water vapour reaches the clouds, it cools down so that the droplets come together to form raindrops. This process is called condensation. As the clouds become saturated, or too full, it falls from the clouds as precipitation. Precipitation is water that falls from the clouds in the form of rain, hail, snow or sleet. Snow and hail are like frozen rain. Sleet is like slushy snow, it falls as rain and freezes on the way down from the clouds. On average, water will stay in a cloud for 8-10 days before falling as precipitation. Most of this water falls back into the ocean, but some falls on land and collects in rivers, lakes and swamps. Some of this water soaks into the ground and we call this infiltration. When the sun comes out again and heats this water up, the water cycle starts again! Evaporation – water changes from a liquid into a gas, or water vapour. Transpiration – water is released as a water vapour through the leaves of plants. Condensation – water changes from a gas or water vapour, to liquid water droplets. Precipitation – water that falls from the clouds in the form of rain, hail, snow or sleet. Infiltration – water that soaks into the ground.